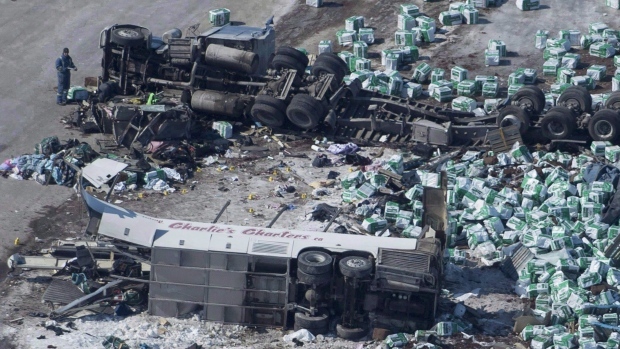 EDMONTON — The owner of an Alberta trucking company involved in the fatal Humboldt Broncos bus crash has been charged. "The charges follow an investigation that was completed by Alberta Transportation into the collision," Mason said. "The investigation found multiple instances of non-compliance of various transportation regulatory requirements in a six-month period." "It's a good start," he said. "Some of the people who did the charging need to look at that, too, because why did it get to that point? It's still happening." — With files from John Cotter and Chris Purdy. Note to readers: This is a corrected story. An earlier version had the owner's first name incorrect and Shumlanski's first name spelled incorrectly.